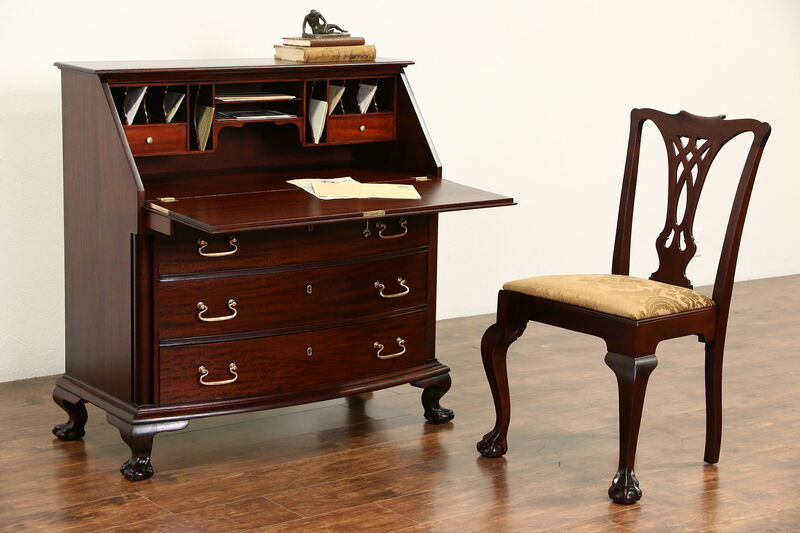 Carved of solid mahogany about 1910 in the Georgian manner, this understated library secretary desk and matching chair is superior quality throughout. The restored satiny finish is excellent. Rosy bronze pulls are original, drawers have hand cut dovetail joints. Ball and claw feet plus the graceful bow front are authentic on this unsigned American made antique furniture. The drop front has a working lock, supports extend automatically when it is opened. Desk size is 42" wide, 41" tall, 21" deep and the desktop is 28" high. The chair is newly upholstered and reglued to serve another generation. Size is 22" wide, 22" deep, 37" tall and the seat is 20" high and 15" deep.